How Do You Spell CYRUS? Correct spelling for the English word "cyrus" is [s_ˈɪ_ɹ_ə_s], [sˈɪɹəs], [sˈɪɹəs]] (IPA phonetic alphabet). 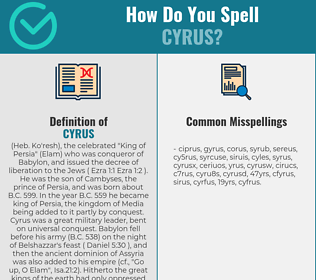 Below is the list of 202 misspellings for the word "cyrus". (Heb. Ko'resh), the celebrated "King of Persia" (Elam) who was conqueror of Babylon, and issued the decree of liberation to the Jews ( Ezra 1:1 Ezra 1:2 ). He was the son of Cambyses, the prince of Persia, and was born about B.C. 599. In the year B.C. 559 he became king of Persia, the kingdom of Media being added to it partly by conquest. Cyrus was a great military leader, bent on universal conquest. Babylon fell before his army (B.C. 538) on the night of Belshazzar's feast ( Daniel 5:30 ), and then the ancient dominion of Assyria was also added to his empire (cf., "Go up, O Elam", Isa.21:2). Hitherto the great kings of the earth had only oppressed the Jews. Cyrus was to them as a "shepherd" ( Isaiah 44:28 ; 45:1 ). God employed him in doing service to his ancient people. He may posibly have gained, through contact with the Jews, some knowledge of their religion. The "first year of Cyrus" ( Ezra 1:1 ) is not the year of his elevation to power over the Medes, nor over the Persians, nor the year of the fall of Babylon, but the year succeeding the two years during which "Darius the Mede" was viceroy in Babylon after its fall. At this time only (B.C. 536) Cyrus became actual king over Palestine, which became a part of his Babylonian empire. The edict of Cyrus for the rebuilding of Jerusalem marked a great epoch in the history of the Jewish people ( 2 Chronicles 36:22 2 Chronicles 36:23 ; Ezra 1:1-4 ; 4:3 ; 5:13-17 ; 6:3-5 ). This decree was discovered "at Achmetha [RSV marg., "Ecbatana"], in the palace that is in the province of the Medes" ( Ezra 6:2 ). A chronicle drawn up just after the conquest of Babylonia by Cyrus, gives the history of the reign of Nabonidus (Nabunahid), the last king of Babylon, and of the fall of the Babylonian empire. In B.C. 538 there was a revolt in Southern Babylonia, while the army of Cyrus entered the country from the north. In June the Babylonian army was completely defeated at Opis, and immediately afterwards Sippara opened its gates to the conqueror. Gobryas (Ugbaru), the governor of Kurdistan, was then sent to Babylon, which surrendered "without fighting," and the daily services in the temples continued without a break. In October, Cyrus himself arrived, and proclaimed a general amnesty, which was communicated by Gobryas to "all the province of Babylon," of which he had been made governor. Meanwhile, Nabonidus, who had concealed himself, was captured, but treated honourably; and when his wife died, Cambyses, the son of Cyrus, conducted the funeral. Cyrus now assumed the title of "king of Babylon," claimed to be the descendant of the ancient kings, and made rich offerings to the temples. At the same time he allowed the foreign populations who had been deported to Babylonia to return to their old homes, carrying with them the images of their gods. Among these populations were the Jews, who, as they had no images, took with them the sacred vessels of the temple.